DULLES, Va.Feb. 9, 2017-- Orbital ATK (NYSE: OA), a global leader in aerospace and defense technologies, recently wrapped up its second Bushmaster User Conference, hosting more than 150 U.S. and international customers and industry partners representing about 25 countries. The highlight of the three-day event was a series of the live-fire product demonstration, including the company s first products resulting from its advanced ammunition R&D program. Customers gathered at Big Sandy Range in northwest Arizona to observe a variety of the company s Bushmaster Chain Guns and automatic cannons firing ammunition ranging from 7.62mm, 25mm and 30mm to the company s newly-developed advanced 40mm family. The event demonstrated the effectiveness of the gun systems and related ammunition in defeating a wide range of battlefield threats through the engagement of a diverse target set including light armor, reinforced concrete structures, trench systems, and brick and mortar walls found in today s operational environment. Orbital ATK showcased the early results of its multi-step growth initiative to develop advanced high-precision medium-caliber ammunition. Customers in attendance witnessed the first public demonstration of the reliability and effectiveness of the company s MK44 chain gun engaging an array of defilade targets with its new 40mm air-bursting ammunition. The next steps in Orbital ATK s advanced ammunition initiative, to be developed over the next two years, will include the introduction of proximity fuzing and precision command guidance into medium-caliber rounds. This key event brings customers and products together in a live-fire demonstration to showcase the effectiveness, reliability and safety of Orbital ATK s Bushmaster Chain Gun line and ammunition suite, said Dan Olson, Vice President and General Manager of the Armament Systems Division of the Defense Systems Group. This yearly event has been very successful in terms of attendance, integration of industry partner vehicles and weapons stations, and the ability to showcase our new products. The centerpiece of the demonstration was Orbital ATK s 30mm Bushmaster Chain Gun, upgunned to a 40mm configuration, firing the company s new 40mm programmable air-bursting munitions. The company also showcased its M230 Link Fed chain gun and 30 mm x 113mm ammunition firing from a variety of light tactical vehicles. Also fired was the 25mm M242 chain gun from the MK38 naval mount. During this year s live-fire demonstration, Orbital ATK publicly demonstrated for the first time its common fuze approach. The development of a standard ammunition fuze creates commonality across multiple round types and offers greater reliability and economies of scale in production that are beneficial to our customers. The advanced capabilities displayed during the live fire demonstration will appear on upcoming episodes of GunnyTime with R. Lee Ermey beginning summer of 2017 on Outdoor Channel. 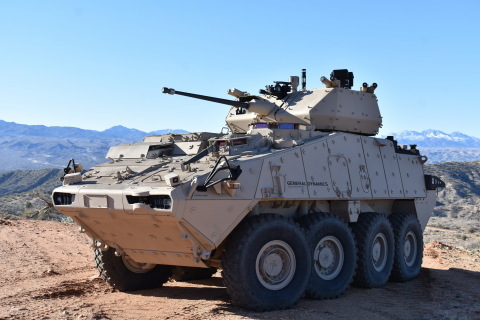 Companies supporting the Bushmaster User Conference included BAE Systems, EOS, General Dynamics Land Systems, Kongsberg, Nobles Worldwide, Oshkosh, Pratt & Miller and U.S. Ordnance, who provided vehicles, turrets, weapons stations, gun mounts and small caliber weapons for the event.